inspiration and ideas for The Stars Are Falling? The idea started a long time ago. I couldn’t get the image of falling stars out of my mind, and the more I thought about it, the more I added onto it. The next image that came was of a young girl running away from the falling stars, running for her life. At that point I wrote it down in my ideas folder and forgot about it for a bit whilst I worked on other things. Then an opportunity presented itself year before last, and I didn’t have a manuscript ready that wasn’t already contracted. Crazy woman that I am decided that ten days was more than enough time to write a book, so I called up my friend Mr Duck to talk the physics behind the story and the main character, followed by a lengthy conversation with my other friend, Alice. She’s my go to buddy for all my sounding board needs. We’ve talked through almost every aspect of everything I’ve ever written. And after an evening of talking through the plot details, I had a plan and started writing. Ten days later, The Stars Are Falling was done. In all honesty, I’d most likely be hiding in a corner of my house trying to keep out of trouble. But I’d like to think that I could hold my own if needed and contribute a couple of ideas to help save the world, even if most of them are only any good in fiction. 3. What is your writing style? Do you write an overall plot plan? Just write as you go and then edit? I have two writing styles: the first being a write and see what happens, approach. The second involving planning and plotting and writing it all down before I start. The Stars Are Falling comes under the second style. I had a very limited time in which to write it, and in order to make sure I didn’t miss anything, I wrote down the whole plot, in detail, before I started. It was an intense ten days, where all I did was write, listen to the same forty songs over and over, and then write some more. Repetition helps me concentrate, so sitting and listening to the same songs on repeat is a normal occurrence when I’m writing. And writing several thousand words in one day comes with its challenges. Which is why I write everything down when I have a short deadline. It helps me get my plot points in order and remember which bits I’ve written and which bits still need adding in. write, and even though my mind was somewhat fried after those ten days, I will never regret having written it. wording, layout ect. was done by my publisher, but they asked me to come up with the idea for it. That took me weeks. I toyed with the idea of just having a meteor on the cover, but decided that would be too plain. Then I wanted a person, but the Stars aren’t exactly people, so I wanted something that would represent what they are without giving too much away.Of course, the other issue was that I wanted something that showed the book was Science Fiction without the typical space ships and little green men. 5. Is the romance between Jenny and Dale a typical YA romance or is there something more? When I set out to write The Stars Are Falling, I didn’t plan on there being a romance in there at all, that part just sort of happened as the story progressed. Once I realised there was going to be a romance, I had one thing in mind: it was not going to be a love triangle. I wanted something simple, boy meets girl, they both like each other, and then the end of the world comes and things get complicated… so, maybe not quite nice and simple, but simple enough. 6. What’s your dream casting? done with my books. I have images in my heads of what the characters look like, but no one ever quite matches up. Also, I am horrible with names, they go right out of my head as soon as they’ve been spoken, so I can never remember who is who. But I am happy to hear from readers who they imagine they they’re reading the books. Everyone sees something different, and I’d rather people made up their own minds. 7. What’s your favourite scene in The Stars Are Falling? because of the death or the start of the action, but because of Mark. This line in particular is my favourite in the whole book: “Dude! You killed an alien! An alien!” He has a knack for making things work whilst also providing a bit of comic relief. 8. 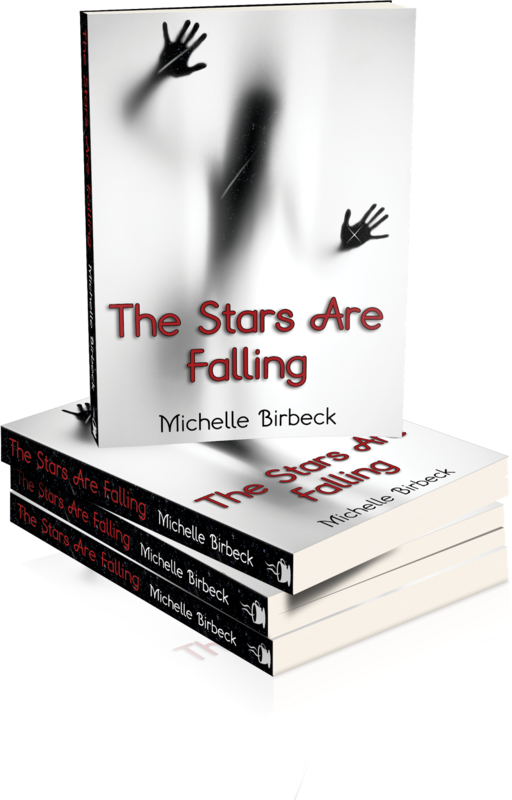 What would you say to my audience to try and convince them to read The Stars Are Falling? I would ask one question: Do you like science fiction? If the answer is yes, then this is the book for you. Science fiction like people used to write when War of the Worlds came out, and The Day the Earth Stood Still. Alien invasions and trying to save the world. And if your answer was no, then this is the science fiction for you. It isn’t filled with little green men and advanced technology that you need a degree in order to understand. It’s action filled, with a touch of romance, and is perfect for both people who like and don’t like science fiction. I am originally from Toronto, Canada. I lived in Italy for a while, and then graduated school from the Art Institute, and then ended up in Philadelphia, PA. I am proud mother of three amazing children, ages ranging from 28, 25, and 8! I work full time as a special needs classroom assistant for the School District Of Philadelphia. Creativity and inspiration derive from my kids, and also being among hundreds of elementary students on a daily basis! 2) What was your inspiration to write and illustrate this book? And why? The Sketchbook Project 2014, part of the Brooklyn Art Library inspired me to write and illustrate this book. This is my third year participating with them. The original drawings are in that sketchbook, which is housed in their library. I always wanted to write an alphabet book! 3) What projects are you working on now? I’m currently revising another children’s book about Moon Trees, and illustrating it as well. 4) Are you interested in writing another genre? Absolutely! I LOVE YA! I’ve had characters bouncing around in my head for a while, and they’re waiting to be written! 5) Did you always want to be a writer and illustrator? Yes, as long as I can remember! I love the power of creativity. 6) Are you a day or night writer and illustrator? The answer is day for both! For me Night=sleep! 7) What is your advice to writers /illustrators? Read, read, read, what you want to write. Learn to storyboard/dummies to see if your story flows. Join SCBWI, go to workshops, and join critique groups. Not only will your writing improve, but you will meet other talented writers and illustrators that also share your passion. Also, if you decide to self-publish, please avoid making the mistake I did! After my book was approved by CreateSpace and up for sale, someone I look up to and admire messaged me and pointed out that there was a typo! I thanked her soooooooo much! I immediately fixed the BOO BOO! 8) Are you a coffee or tea person? 9) Are you a lefty or righty? After fracturing my dominant hand earlier this year, I became aware that I’ve been ambidextrous and never knew it! Now I can alternate between the two and have two unique styles of drawings. Actually, the Lion book art was illustrated with lefty, while the animals in the book were illustrated with righty. So yeah, no matter what life throws your way, pick yourself up and find a way to continue what you love to do! 10) What is your favorite illustration medium? My favorite illustration medium is combining watercolor, and pen and ink. I love having the freedom of colors blending into other colors, creating unique effects. Detailed pen and ink is a form of de-stressing! 11) Why did you decide to self-publish your first book with CreateSpace? Author Interview: What music inspires you while you write or create words from thoughts and images in your mind? I am one of those people who sings in the car. Very loudly, much to the amusement of fellow road users, who are often treated to the sight of my tonsils as I attempt to hit the high notes. In fact, I was recently diagnosed with nodules on my vocal chords. Apparently I don’t use my voice correctly – hardly surprising since I can’t sing a damn. But it doesn’t stop me trying. Music is, in my humble opinion, one of the purest art forms. My taste in artists varies from Abba to the Smashing Pumpkins and there is not an iPod on the planet that could hold enough songs to satisfy me. 1. How does the third book in the Daniel Brothers series connect with the first two? Each of the Daniels Brothers books is dedicated to one of the four brothers. In the first book, Behind Closed Doors, Chris found his lady. In the second, Red Zone, Gage met his match in Rebecca. Crossing The Line is Paul’s chance to find love again after the loss of his wife. 2. Could you pick a favorite brother in the series? Oh that’s hard. I love each of them for different reasons. Since I just finished Paul’s book, I guess I’d say him. 3. Which character was harder to write Paul or Megan and why? Megan. I always seem to have a more difficult time writing my heroines. 4. Paul is a detective, did you have to research the life of a detective to get it right? I did consult with a fellow author who also happens to be a detective. She helped with some of the terminology and what would be considered ‘normal’ in a police environment. 5. What is the most important writing tip you have learned through writing this series? Follow where your characters lead. The fastest way to encounter writer’s block is to try to force the story in a direction your characters don’t want to go. Let them go along on their merry way, and just be there to put it all down on paper for others to enjoy. 6. Tell us about the cover art for your novel. One of my favorite parts of the book is the times when Paul and Megan are cuddling in bed. There is one specific time that the picture on the cover brings to mind. I thought it was a perfect representation of them, and the story. Then, of course, there is the police cruiser and the crime scene tape as a homage to Paul being a cop and the mystery side of the story. 7. What are you writing next? I’m currently working on the first book in a new series that will revolve around a club called Serpent’s Kiss in the heart of St. Louis. The prequel to the series, Welcome to Serpent’s Kiss, will be available in December. 3. If you were an animal what would you be? Getting yourself started on a story or finding the inspiration to continue one can be tough. Maybe the most difficult parts of all for me are rewrites and editing, but in either case sometimes it’s really important to immerse yourself in other material to get your own thoughts moving or some other activities to put some distance between yourself and the work. Reading other indie authors – I often learn some of the most valuable lessons as a writer from reading the work of other indie authors. Whether their work is groundbreaking, flawed, or quite possibly both I often like to think about what I would do differently reading through their plots and characters or what interesting lessons I can take away. Reading non-fiction – Reality can certainly be stranger than fiction in so much of life. I’ve recently gotten a lot of ideas from reading Nathan Rabin’s You Don’t Know Me But You Don’t Like Me and Lawrence Wright’s Going Clear. I like to think about topics and areas of history that interest me and dive in. There’s so much inspiration to be had from real events, whether they’re adapted to fantastical settings or just research for recreating something different. (and 4.) Hulu (binge-watching) – Netflix (binge-watching) – Bit of a cop-out to pick these as two separate choices, but they are certainly two distinct animals. I really like following TV shows multiple episodes at a time. As so many serial dramas unfold like visual novels, they can teach any writer about pacing, character development, and more important aspects of storytelling. Netflix’s originals like the beloved Orange Is the New Black is a fantastic example. Hulu I use often to catch up on TV shows swaths at a time. I usually rely on it for new shows, because watching the pilot and first few episodes is a poor indicator of how most shows turn out. Binge-watching can often help the viewer see the evolution of a show’s creative process unfold in real time. Running – I’m not a marathoner or anything, but a few good miles can help me leave behind what’s bothering me. During my runs I often think through sequences or passages of my stories for how I can improve them. Since I live in the DC area, running through the national monuments and mall can be particularly inspiring sometimes. Also, the quasi-delusional state people call “The Runner’s High” has provided me with the occasional mad epiphany. More often it’s provided me with a lot of exhaustion and pain, but you take the good with the bad. The Dissolve – Where many of the AV Club’s best migrated, particularly the indispensable Nathan Rabin and Tasha Robinson. The site’s think pieces about film and TV that cut deep into old favorites or maligned hack work with equal measure. Gaming – Always a vice, a distraction, and a source of inspiration for me in one package. Particularly for RPGs, I imagine and speculate at the backstories and motivations of the characters far more than I should. I spent more hours thinking about my Commander Shepard(s) in Mass Effect than was healthy, and the endless protagonists I pushed through Skyrim even more. The less we talk about Dragon Age and what its upcoming sequel will do to my personal life, the better. The added layers of meaning that I gave these games often found new homes elsewhere in my writing. Podcasts – Besides the basic value of entertainment podcasts provide, listening to interviews like those in WTF with Marc Maron and Walking the Room helps get me in the headspace to write realistic dialogue. Then there are just straight-up educational podcasts like Stuff You Missed in History Class and 99% Invisible that are full of fascinating information and nuggets that can be helpful later when you’re stuck in a plot hole. Music – I’m one of those infuriating people who say “I like all music” and mean it. My favorites are probably fuzzy rock, hip hop in the mid-to-late 90s and early 00s mold, 60s jazz, and my guiltiest pleasure, just about any form of EDM. Music can make me feel the right moods and atmospheres. Things are not as the should be in Pennywhistle! Enchanted toasters are not toasting, enchanted sprinklers are not sprinkling and Hobart Hucklebuck’s origami messenger birds are suddenly attacking him. Someone seems to be draining the power from all of the enchanted items in the village. But who could it be and why have they implicated Hobart’s grandfather? Follow Hobart and his friends, Specks Spacklethack and Rosie Rumpleskirt, as they try to solve this mystery and free Hobart’s grandfather from the Tower of Tribulation on Mumblemonk Mountain. The trio’s investigation into the mysterious happenings on Druid Lane gets them into hot water more than once and ultimately brings them dangerously close to disaster not only for themselves, but the entire village of Pennywhistle. Although the book is basically a middle grade fantasy novel, it is also an adventure novel, a mystery novel and more. It uses lots of humor which should appeal to the age group although I know many adult readers who enjoyed the writing style as well. They are simply a mix of myself as a child and the kids surrounding me during those years. I love creating characters. If you don’t have solid characters in your book, then even if you have a solid story line, the book will fall flat. I know my characters very well before I ever put pen to paper. This way I know what they are going to say or do as new situations present themselves. Although every once in a while they surprise me and do or say something I wasn’t even expecting. I guess that’s part of the magic. The characters really seem to come alive. I grew up loving fantasy and science fiction although I became a Stephen King fan as I grew older. I still enjoy sci fi and fantasy although the steampunk genre has recently caught my attention. I really have no favorite place or time to write. I usually write with pen and notebook while sitting on my sofa. I can usually shut out my surroundings, so it doesn’t matter if the TV is on or people are talking around me. Now if my wife asks me to empty the trash, well, that’s a different story. J Same thing with a favorite time to write. I might wake up in the middle of the night and complete a chapter or it can be the middle of the day. It really doesn’t matter. Music is the one thing that can be a distraction. I think it’s because I am also a singer/songwriter and end up listening to the music rather than concentrating on the manuscript I might be working on. I don’t think there is really an easy part to the writing process. Writing is just as hard as having any kind of a “day” job – of which I have had plenty. The most fun for me, however, is coming up with new story ideas. I would have to say that editing is the hardest part for me. Well, maybe not hard, but it is definitely the part I enjoy the least. Two things an aspiring writer needs to do to improve their writing. Read a lot and write a lot. There’s no need to go buy a bunch of books on writing. Just do it. That’s the only way you will improve. I just sent the second book in The Misadventures of Hobart Hucklebuck to the publisher and have started the outline for the third book in the series. There is also a sequel in the works to Horror High School: Return of the Loving Dead (young adult novel) which I co-wrote with Araminta Star Matthews. (If you’re a Buffy fan, that book should be on your reading list. LOL.) I am also writing an adult horror book with Bram Stoker award-winning author Joe McKinney. I always start with a basic concept and let it roll around in my head for several days to make sure the idea is really solid enough to begin working on. Then it’s time to begin the outline. I almost always use an outline which usually ends up 12-15 pages long before I begin the actual writing process. The outline , of course, can change as I write, but at least I always basically know the direction things are headed. Once my outline is finished, I begin to play out each scene and chapter in my head as if were a movie. Once it flows fairly well, then I put pen to paper (or fingers to keyboard). When the rough draft for that chapter is done, I move on to the next chapter and do the same thing. I don’t start the editing process until the entire manuscript is finished. Not really! I’ve always loved to read – I devoured every book I could get my hand on as a kid and libraries and bookstores are still my favorite places to hang out – but for a long time I never imagined writing a book of my own. That seemed huge, daunting, something only mythical figures of literature managed to complete. I wrote a lot – research papers mostly, technical analyses, that kind of thing – but it was only about five years ago that I sat down and started to slog my way through writing my first book. I was really naïve then and that’s probably a good thing. If I’d known then how competitive the publishing market is I might never have started! 2) Where did you get your inspiration for Breakshield? Things get ugly, we learn a bit more about Jamie and he gets into a lot more trouble. Typhon will be back of course – anyone who read BREAKSHIELD will know that guy’s not going away – and some new and unexpected adversaries pop up in unexpected places. Vague enough for ya? 🙂 Ok, what else could I spill? Book 2 definitely provides more insight into all the major characters, filling out some of the backstory and motivations for Morgan and his crew. And there’s lots of Kitsune. Lots and lots of Kitsune. That should make some people happy. 4) What is your writing style? Do you outline, write everything by hand first or do it all on a computer, ect..? 5) What character do you relate to most? Probably Jamie. 🙂 He’s just an ordinary guy surrounded by extraordinary people in extraordinary situations. He’s a little scared (ok, a lot), a little mad, nervous, curious, amazed, defiant – he’s everything I’d expect a real person to be in a messed up situation like he’s dropped into in the Between. That said, I can relate to just about all the characters in BREAKSHIELD: Morgan’s willingness to do the right thing even if it’s the hard thing or the unpopular thing; Kurou’s calm demeanor and quiet force; Hallea’s level-headedness and strong moral center; Hakkon and Tussle – the mess-around twins. And Kitsune. She’d my favorite character. And she’s the strongest of them all. 6) Who is your dream cast if your book ever became a movie? 7) Where else can we see your work? I’ve got several short stories out there. The Ice Dragon is a stand-alone available through Amazon and in Zharmae’s Irony of Survival Anthology, Fairest Fowl just got published in IFWG Publishing/SQ Mag’s Star Quake 2 anthology, and Infinity was included in Infinite Acacia’s Infinite Science Fiction anthology. Both of those anthologies are available through Amazon as well. 8) What authors are some of your favorites? I really admire C.J Cherryh’s work – both her sci-fi and fantasy stories – and I think her writing had the most influence on my own. Not that I’m claiming to write like her or as well as her, but I love how she weaves in themes from folk tales and mythology. And her characters…she creates these amazing broken, wounded characters that are so pissed off at the world. There are a ton of other authors I really admire (Neal Asher, Steven Brust, Charles de Lint, Stephen King, Bernard Cornwell) and though the style and themes of my writing might not necessarily be like them, reading their work, seeing how they build a story and string words together has definitely helped me to develop my own style. I’m also extremely fortunate to know a few upcoming writers that are part of my writing group. Laura Lam – author of Pantomime and Shadowplay – writes amazing, award-winning LGBT speculative fiction that is beautiful to read, and John Dixon – author of Phoenix Island – saw his novel adapted for the TV show Intelligence. Their work is incredible and they’ve both helped me out along the way. 1. What is your favorite character in your book and why? My favorite character in the series is Tellius. I have a soft spot for damaged characters, for people with tragic pasts they have had to overcome, and that is Tellius in the story. He’s a hero for real people ⎯ far from perfect, and sometimes all too flawed, but striving always to be a good man. He puts others above himself, and he loves Darcy selflessly. What more could you want? 2. Why do you think your book is appealing to a young adult audience? My series is appealing to a young adult audience because I’ve written characters that are easily relatable to young people, and to people who remember what it was like to be young. The setting and circumstances are fantastic, but that only adds to the appeal because I think young people really like to imagine what it would be like to be heroes and heroines of their own adventures. When a young reader feels appreciated and understood, and not condescended, I think they will gravitate toward your books. I’ve always tried to portray teenagers realistically and to show them that while they aren’t the center of the their own little universes, they have a lot to contribute for good in this world. I think my young readers pick up on that. 3. Do you think your book is a crossover book and why? I know my books are crossover books because my readership base proves it! While my largest number of readers definitely falls within my target YA audience, the second largest group of Gateway Chronicles readers is between ages 30-50. I think this crossover fan base started because there were parents out there who wanted to preview the books their young adults were reading, but then found much to appreciate in the books themselves and got hooked. I deal in timeless themes, such as good vs. evil, the nature of man, providence and destiny, etc., and those themes never go out of style, no matter the age of the characters in the stories. There is also plenty of high adventure, fighting, and other elements generally considered masculine in nature, so boys and even older men have expressed being enamored with my stories. Of course, when I first starting writing The Gateway Chronicles, I hoped they would end up appealing to a crossover audience, but it’s been so surprising and gratifying to see that actually happen. It makes me very happy! 4. What other books have influenced you in writing your book? Harry Potter influenced me in structure and general storytelling technique. The Chronicles of Narnia influenced me in aspects of portal/liminal fantasy. The Lord of the Rings influenced me in how to make a story epic. Pride and Prejudice influenced me in how to make a story character-driven. 5. What is it about your book that this generation of young adult readers needs? This generation of young adult readers is so ridiculously self-centered. They are rarely encouraged to look or think beyond themselves and their own desires and needs, and most of what they consume in entertainment just reinforces this. But this sort of mentality leads, and has led, to a host of social problems, including, but not limited to, bullying, chronic depression, and suicidal tendencies. My books demonstrate to young adults that there is a way to grow in your own abilities without only serving yourself. My young adult characters go through journeys of discovery that encourage them to put others first, to be forces for good, and to use their individuality to contribute in meaningful and positive ways to the world. I think this is something all young adult readers need to learn and understand today. 6. What makes your book unique from other young adult books out there today? I have not seen anything quite like The Gateway Chronicles out there right now, whether we’re talking about the sorts of themes and issues I deal with, or the structure of the books themselves. My characters start out at age 13 in book 1, The Six, and by the time you get to this latest, and last, release, The Bone Whistle, they are all 18 and have gone through these great adventures and transformations. I really take my time in telling the whole story and letting the readers grow alongside the characters, and I hear all the time from readers that they craved another experience like that after reading Harry Potter that wasn’t replicated until they read my books. Of course it’s always super, super, nice to be compared to Harry Potter, and that has let me know that I’ve really hit on something special. 7. Where did the inspiration for your main character come from? The inspiration for Darcy Pennington, my main character, was primarily myself. I definitely drew from personal experiences and memories when writing her as a 13-14 year old ⎯ when she’s in her early YA doldrums ⎯ but then as she grew and matured, I tried to make her into the sort of teenager I wish I could have been. So I always tell readers that young, immature, negative Darcy was me, and older, more mature, positive Darcy is the person I wish I could be. 1. How does it feel to be closing up a series? Happy… Sad…? A little of both. I’ve been immersed in the lives of these characters for more than four years now, so it’s difficult to say goodbye, especially to Ava. The MORE Trilogy is her story, and it’s been quite a journey for her – from discovering she’s not who she thinks she is, to developing her rather unusual abilities, to the final confrontation with the man who’s been pulling the strings of her life for a long time. But I think we leave her in a good place. At the same time, I think I might write a little more in this world at some point in the future. I’m not sure how much or when, but I think there may be another story to tell at some point. 2. How has your writing progressed through this series, have you learnt anything significant about writing a series? Oh, it’s been such a learning process. When I wrote and submitted MORE, I had maybe three sentences that fleshed out the other two parts of the series. I had a general idea of the big story arc, but none of the details, really. If I were to write a series again, I’d definitely map out all of the books with a bit more detail right from the beginning. I hope that I’ve grown as a writer and a storyteller throughout the series. I’ve been fortunate enough to work with mostly the same editing team through all three books, which was a huge blessing. I’ve learned so much from them – especially about my own bad habits. I’m working on those! 3. How has the relationship between Ava and Caleb grown over the series? Did you always know which path their relationship was going to take? I had a general idea of how I wanted the relationship to develop, but a lot of it was dependent on the other aspects of the plot. They were on the run, fighting for their lives, so that affected their relationship a lot. I knew I wanted them to be on equal footing. Caleb doesn’t have to rescue Ava – or at least if he does, then sometimes Ava rescues him too!  They learned to trust and depend on each other, but it’s not an easy thing. Ava has secrets she’s keeping from Caleb in TWELVE – and although it’s understandable why she chooses to do that, it puts a strain on their relationship. Like with any couple, it’s a learning and growing process. 4. Why the number TWELVE? The number twelve is significant in many ways – twelve signs of the zodiac, for example (as mentioned in The Guardians). It’s also thought of as a number of completion or totality in the Bible. The Race and Half-Breeds were originally inspired by the mention of the Nephilim in the Bible – so it was natural that twelve would have a place as well. Elias Borre, the creator of the Twelve, definitely has a God complex, so I’d see him fixating on that – twelve tribes of Israel, twelve apostles of Christ, and, moving into Greek mythology – the twelve major deities of the pantheon. 5. Talk us through your cover, why the DNA strand? Is there a deeper concept of this in your novel? The DNA is especially significant for the Twelve in that they were genetically engineered. There are also aspects of their DNA that link them to each other, and also to their creator. But there’s also an ongoing theme throughout the trilogy – that you are more than where you came from. Although the Twelve, and Ava in particular, were created for a specific purpose, they do have a choice. Which is the same for all of us. Yes, our DNA determines what we look like, our natural abilities, etc. But what we do with that is up to us. 6. What is up next for you? Will we be seeing another series from you or another stand alone novel?I’m working on a few things. The first is a short story that will be coming out in the Frequent Flyers Collection on November 1st. It’s called Unscheduled Departure. Summary: Rowan Elliott is devastated when her boyfriend, Finn, tells her he’s moving across the country to take over the family business, and thrilled when he changes his mind at the last minute and gets off the plane. But then things get . . . weird. Finn’s acting strange, and Ro’s getting mysterious phone calls that have her questioning if her boyfriend’s really who she thinks he is. As Ro races to figure out what’s going on, she discovers it’s more complicated than she could have ever imagined. And if she’s not careful, she could lose her Finn forever. I’m also working on a full-length, stand alone novel that I’m having a lot of fun with. It’s a time-travel/alternate-reality story about a woman who goes back to high school (literally) and makes a few changes with some unusual consequences. I love anything that puts a traditionally antagonistic character in the spotlight and tricks a reader into liking them. Eighteen-year-old murders who kill off peers for the sake of making it off their dream college’s wait-list; advisors to the king who stitch strings of anarchy through their smile; space-age bounty hunters with an old dog and too many voices in their head; and other “ne’er-do-wells” have their own stories to tell, and in my opinion, theirs are way more interesting. Oh goodness, there are a lot of characters in Zhukov’s Dogs I’d love to tell you all about, but that would take far too long and this is only the second question, so we’ll focus on the first two you’ll meet. Our protagonist, Nik Zhukov, was loosely inspired by a shadowless freerunner I met in a nightmare right after moving to Seattle in 2009. He was an unapologetic badass that lingered in my mind and developed through a series of short stories before becoming the Nik readers encounter today. Next we meet Cameron Elizabeth Halliburton, and she was just delightful to bring to life. Initially, there was no dual storyline in Zhukov’s Dogs, meaning Dr. Halliburton wasn’t around for the first draft. I really wanted to establish right off the bat how severely Seattle damaged Nik, though, and Dr. Halliburton emerged to rake that out with her perfect magenta manicure. For her, I relied on memories of all the conniving, two-faced individuals I’d encountered while growing up, from professors to peers, to create a person nobody –especially Nik – would ever want to be locked in a room with. I’m a big fan of sci-fi worlds built out of an apocalypse, the kind that really make you go “what if?” in a way that leaves you simultaneously envious and relieved that you don’t live in your characters’ reality. Zhukov’s Dogs was basically conceived, drafted, and edited in a blue papasan my fiancé and I carried through the streets of Seattle in 2011. It’s easy to tell when a writer’s block hits these days because that ridiculously comfy chair suddenly becomes a storage unit for all the laundry I don’t have the motivation to hang up. As far as when the writing happens, I’m an insomniac with a day job, meaning most of it goes down between 9 p.m. and 3 a.m. Sleep is overrated. There are waaay too many thoughts bouncing around my head when I’m brainstorming, so I try to avoid music until I have a very clear, sloppily written idea of what I’m thinking, where it came from, and where it could go. Music when I write is a different story. I need background noise when I’m at my keyboard, preferably a playlist I’m familiar with so I don’t have to constantly flip between writing and song searching. The Civil Wars, Hozier, Alt-J, Mumford and Sons, and Artic Monkeys were my go-to’s for Zhukov’s Dogs, but there were scenes where I really couldn’t help but bust out some Glitch Mob, White Stripes or Childish Gambino. The hardest part, at least for me, is making myself sit down at my keyboard and actually write. I do a lot of planning and plotting, both in my head and in a little blue journal, which seems smart until I realize I only have a few thousand words of the actual story written. I spend too much time thinking about where it’s going and not enough time writing my way there. I’d say the easiest part is the worldbuilding side of writing. Maybe “easy” isn’t the best word, considering how much time it takes, but it’s so seamless and fun that you don’t really realize how much work goes into it. If you love to write, keep writing! You’ll run into plenty of people – mentors, family, critique groups, agents – who aren’t in love with what you’re working on, and that’s fine. Just keep writing, and write for you. There’s no point in selling a story if you’re unhappy with it. I’m currently working on Book One of a fantasy trilogy. I expect to have it complete by the end of November, but it’s somehow become quite massive since conception and it’s very slowly killing me, so we’ll see how this goes. There’s a little blue journal by my bed I’m constantly filling with story ideas. A lot of those go nowhere. The ones that make it past the initial premise outline (setting, conflict, theme) get quick character biographies. Sometimes a premise sounds great, but the characters fall flat or bore me out of the idea. If I can make it through premise outlines and some character establishment without losing interest, I draft a loose outline of the story’s first half, just to make sure there’s enough there. These outlines can usually be done in an hour or two, and I’ve found them extremely helpful when it comes to weeding out ideas. There is a part of me that has always wanted to be a writer, although I didn’t always think I would make a career of it. Writing a book was a romantic idea for me when I was young. I escaped into different and idealized realities by reading stories, and I quickly came to realize that writing my own stories could produce the same effect – and not only that, but I could control the destinies of the characters in the stories! That was, and still is, an exciting prospect. I started writing my first novel when I was eleven years old, but that desire existed within me from the time I first became aware of books. Every book I write is always the product of several months, and sometimes several years, of careful planning, so the length of that part of the process varies. But I do all that planning so that when I sit down to actually start writing, I should be able to write straight without stopping. This part of the process – the actual writing of the book – usually takes me 6 to 8 weeks, and my books are always over 100,000 words, so I write several thousand words a day. When I’m writing, my work schedule is totally insane! In the past 7 ½ years, I have written seven books and given birth to four sons, in addition to working fulltime as a teacher and travelling for author “gigs.” So when I’m actually writing a book (and not just planning, editing, revising, marketing, etc. ), I have to squeeze time in late at night. For the 6-8 weeks it takes me to write a book, it’s not uncommon for me to be at work at my school for nine hours, then it’s home to cook dinner, help the kiddos with homework, do some housework, etc. for the next three hours, and then spend some time with my husband after he puts the kids to bed (bless him) until about 10 or 10:30. Then once he goes to bed, I get to work on writing and write for 4-6 hours before crawling into bed for a scant few hours of sleep before getting up and doing it all over again. It really is insanity, but it only lasts for a few weeks, and it’s such a weight off my shoulders when I finish a book. Aside from my crazy work schedule, I guess my interesting writing quirk is that I love listening to movie/TV scores when I’m writing. Music written for movies can be so epic, and it puts me in the mood to write epic stories. And I tend to match the type of movie scores to the genre of book I’m writing. So for Breeder, since Dystopian is an offshoot of Science Fiction, I listened to the soundtracks for Tron, Star Trek, LOST, and Ender’s Game, primarily. I get my information and ideas for my books from all over, and inspiration can strike at the oddest times. For Breeder, the inspiration for the main conflict came from an article I stumbled upon online, and then once I had that idea in my head, I did a lot more Internet research to flesh it out. I also drew information and ideas from my knowledge of history for Breeder, too, as I’m a historian. There are a lot of references to Spartan history, for example. I even drew the term for the schooling all citizens in the world of Breeder go through as children, “Agoge,” directly from ancient Sparta. When I’m not writing, I still don’t exactly have much free time, but when we can, my husband and I like to get our boys out to parks to kick around soccer balls, play on the playground, and hike trails. I love to hike, actually, and wish I had more time to do that! Aside from family time, though, I love a good movie, and thankfully my husband and I have identical taste in movies. We love action, sci/fi and fantasy, and superhero movies, so we never miss, for example, a Marvel release (I’m a huge Marvel geek). We love to travel, as well, and my husband and I got to take a trip to Ireland, Wales, and England this past spring as a belated 10th anniversary trip. We basically backpacked around and saw as much history and culture as we could in eight days. It was divine. My boys are too young to have much of an opinion, although my oldest (age 7 ½) is starting to catch on that I’m a real author. But he has a skewed understanding of what that means. This past summer, he was confused when the man who runs our community pool didn’t know who I was because, “Mommy, aren’t you famous?” lol. In a couple years, though, he’ll be old enough to read my Gateway Chronicles books, so we’ll see what he thinks at that time. But my husband is very, very supportive, and he genuinely enjoys my books (his favorite by far is Breeder). My sister and brother-in-law are big fans of my books, too, and one set of my grandparents did my Gateway Chronicles with their book club. Basically everybody is generally supportive, but they all collectively think I’m a little crazy, too. One of the most surprising things I learned early on in my publishing journey came when I got to work with my first professional editing team, and that was the fact that I still had a lot to learn about writing. Yes, natural talent is important in any artistic endeavor, but natural talent will only get you so far. Writing is a skill and a craft that needs to be honed and practiced, and there were so many principles of writing I didn’t know before working with my editing team. I felt as though I was a good writer before I signed with TWCS Publishing House, but I came to realize that while I was a good storyteller, I had a lot to learn in the writing department. That was surprising – and humbling – and it’s a realization I think every writer has to go through at some point to be able to move forward into serious writing. A good story deals with timeless themes, it must say something that is true, and it must be beautifully (artfully, skillfully, etc.) constructed. Truth plus Beauty equals Goodness. This is a mantra I stick to in my storytelling, and it’s constantly on my mind when I’m reading books (and watching movies, TV, listening to music, etc.). I don’t think it has anything to do with how many copies of a book are sold. There are tons of really great books out there that haven’t sold more than a few thousand copies. Conversely, there are tons of really terrible books that have sold millions of copies. Sales numbers are not the barometer of what makes a good book – it’s what’s between the covers.